Team owner Michael Petersen announced today that Peter Motorsports / White Lightning Porsche will be raced at Sebring next month by team regular Jörg Bergmeister, his brother Tim Bergmeister and 2003 Petersen / White Lightning Sebring pilot Nic Jönsson. 2005 Petersen / White Lightning driver Pat Long is racing a Penske Porsche RS Spyder in the Mobil 1 12 Hours. The team will be attempting to continue its Sebring record of second in class in 2003 (Mowlem, Jönsson and Stanton), third in 2004 (Stanton and Murry) and first in 2005 (Bergmeister, Long and Luhr). 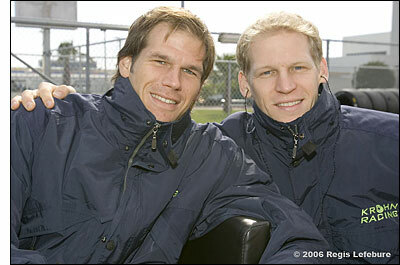 The Bergmeister brothers (right) raced together in the Nurburgring 24 Hours in 1999, finishing third in class. 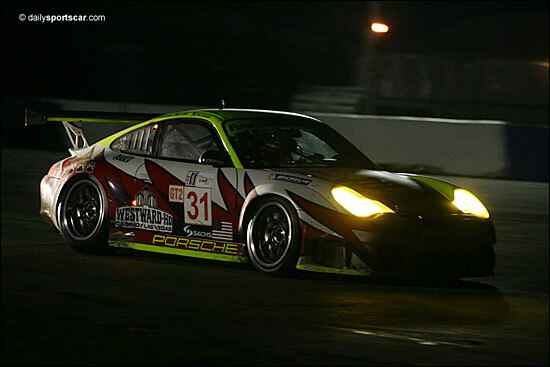 Tim Bergmeister, the elder brother, will be making his ALMS debut next month. He has been racing in the Porsche Supercup, finishing third in the points in 2004 and 2005. Continuing the ‘brothers connection’, Nic Jönsson’s brother is the chief mechanic for the Penske IndyCar programme - while his father was Ronnie Peterson’s mechanic. The #31 Porsche entry will be a brand new example of the RSR model. The full-season driver line-up will be announced in due course. These two drove for the Krohn / TRG team in Grand Am last year, and are together again in 2006 in that series. For the first time ever, a Mike Petersen entry will not feature the Westward Ho Casino as part of its livery: the casino was sold last November, has been demolished, and is in the process of being replaced.